Do you enjoy a glass of wine/beer/cider/vodka whatever, in the evening and wish you could switch to something a little less alcoholic on occasion? “Noooo!” I hear you cry. Haha. Okay, well you carry on then. I’m not here to judge or lecture! Do you enjoy a glass of wine/beer/cider/vodka whatever, in the evening and wish you could switch to something a little less alcoholic on occasion? Noooo, I hear you cry. Haha. Okay, well you carry on then. I’m not here to judge or lecture! Haha. Okay, well you carry on then. I’m not here to judge or lecture! If you doooo wish there was something a little more exciting than water or fruit juice in your fridge as an alternative to alcohol or a lunch/tea-time coffee, how about making a ginger bug? I’ve dabbled with water kefir before now, although have yet to share it on this blog. 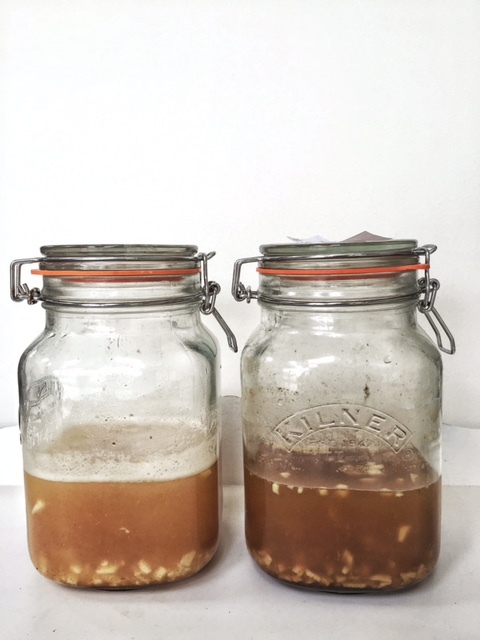 I ditched it because milk kefir is so much more powerful and in those early days of understanding fermentation, I wanted to stick close to the most health giving ferments; the ones that made a noticeable difference to my body. Now I’m branching out. Why? I’ve noticed that the longer I eat this healthy diet, the less my body enjoys the occasional alcoholic drink. I did recently try organic, sulphite free wine (hard to source the white, easier with the reds) and found that a couple of small glasses didn’t make me either tipsy or hungover, where normal wine would these days. I tried an organic cider and again, it was fine. I’m not one for drinking daily now, and if you’re seeking a similar change, it’s nice to have variety of other drinks on offer. I love a fizzy drink and usually have sparkling water in the evening. Now? It’s ginger bug time! It’s sugar heavy although, naturally, some of the sugar is eaten by the bacteria during the fermentation process. It’s a lactic acid ferment, requiring just fresh ginger, water, and sugar to feed the process of fermentation, lactobacillus being present on all plants and ready to kick start it’s chemical transformation as soon as it’s placed in the right environment. For this experiment, I’ve used two clamp down jars and run two different ferments. One is more traditional and the other, I devised myself and haven’t heard of being done, although that’s not to say that it hasn’t been enjoyed by others! This ginger bug experiment is an ongoing one, so the ingredients above will need to be replenished on a regular basis, hence no measurements are included. As with all fermentation, there are no real rules! It’s about working out what rocks your own world! Traditionally, sugar is used with the ginger. As you know, I don’t use any refined sugar and whilst white sugar is often recommended for this and other sugar waters – such as water kefir – I choose to use brown, unrefined sugar and accept that I’ll have a murky brown looking drink, rather than a pretty, clear one, that can be coloured with fruits later. This is a compromise I’m always prepared to make, in order to create the healthiest options possible. Whilst visuals are important, for me, they take second place to quality. Is this for you? If not, you’re at liberty to make your own choices. During a live ‘broadcast’ on social media, one of my followers (thank you Becky Melton!) named my ginger bug jars, after I suggested we give them both names. Fred is going to enjoy being fed with dates. And Ginger is the sugary one. Of course .. I did continue running my ginger bug experiment, created a nectarine soda but lost the recipe. Oops! I’m now back on my naturopath’s diet and most fermented food is OFF my menu for the coming months, so I’ll have to start a new one when I’m back on my usual diet again. To create soda drinks, take 1 pint of distilled/mineral water, add 1/8 cup of ginger bug (as per this chart, once the content is at least mildly fizzy) and add your flavours, be it a herbal tea, a little fruit juice, sweet spices etc. This sounds so good – may try it but just not sure about any kind of sugar for me. My pancreas screams NO! at sugar no matter what the colour – it was all those years of bingeing on the huge bag of chocolate bars (Bounties, Crunchies, Caramacs, Fry’s chocolate creams, Munchies etc etc) my dear old Grandma brought me every Wednesday. My poor pancreas can’t even cope with too much fruit sugar. Such a shame as this sounds heavenly. Dare I? To be honest Gilly, I’m not sold yet either. I avoid adding too much sugar to my own diet. Although much of the sugar is eaten during the fermentation process, I haven’t measured what’s left, so it’s hard to say what you’d be drinking.